For parents, rolling causes sheer panic, since many are already aware that Safe Sleep Canada recommends babies sleep on their back right from birth without the use of any sleep positioners. 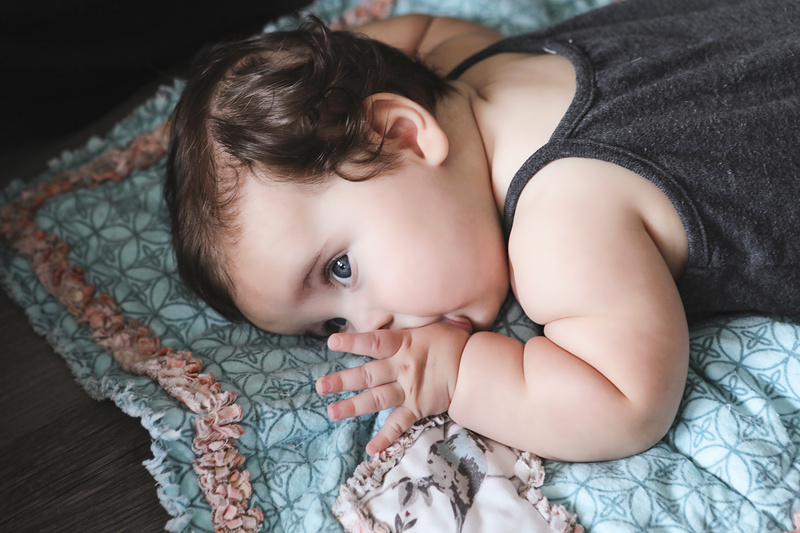 If your baby is swaddled, it is important that you now remove the swaddle and opt for a sleep sack, blankets are still not safe for babies of any age. Have a look at my Safe Sleep Environment blog for the latest and greatest on sleep sacks and how they can ensure your baby continues to have safe and peaceful nights. At the time of publishing this blog, the Canadian Paediatric Society safety recommendations state that your baby must be placed on their back to sleep and if they roll onto their tummy “you do not have to reposition your baby onto his or her back to sleep.” I would have a good read through this resource to settle any fears you may have about it. So once your baby is rolling to their tummy, you may leave them there! Your job now is to get your baby as much practice as possible, so they become confident little tummy timers and rock star rollers and to make your baby’s sleep space is as safe as possible. I hear very often “my baby hates tummy time”. The funny thing about this is that for many of my past clients whose children were carrying sleep debt from terrible nights and naps, they saw an improvement in participation of tummy time after baby began getting more sleep! My theory is that being on your tummy requires a lot of energy and mentally they are processing how it feels, how things look from that direction etc. So, if you were always overtired and lacked energy, you wouldn’t much like working hard at learning something new that requires lots of your energy either. Don’t give up, try and practise 4 times per day for 5-10 minutes each time. I used to roll a towel and slip it under my kid’s arms across their chest, it held them higher and gave them a much better view of the world, alternately you could use a breastfeeding pillow in the same way, until they become more confident being completely flat on the floor. Also, don’t be afraid to get down on the floor with your baby and have some mommy tummy time! This may offer your little one some much need reassurance and a decent little stretch for you. Practice, practice, practice. Now, most babies, don’t learn the lesson quickly. They don’t just roll themselves awake once, call mom and dad to the rescue and then go back to sleep for the rest of the night… They do this routine every 90 minutes, GAH! It’s unrealistic to think that you would be up all night flipping your baby to their back again. If it’s happening all night, they are likely choosing to be on their stomach or, dependent on your babies age, they have learned that flipping to their tummy gets mommy and daddy’s attention. So here are a couple tips to help overcome the milestone as quickly as possible, though you should expect a few days of sleep disturbances! Let’s say you hear your little one cry out and you see right away on the monitor that they have flipped to their belly. I want you not to wait any time at all and just SWOOP on into their room, gently, silently, and quickly flip your baby back to their back and SWOOP right back out of there. You want to make sure you don’t pick your baby up to flip them, the idea here is that you have very little or no interaction so that you do not further upset your baby and motion them to figure it out themselves. For instance, bring their arm down to the side of their body and use legs or hips to gesture the rolling to back motion as you flip them. This, with tummy time during the day, will help your baby build their confidence and ability in rolling themselves to their back on their own. If your baby flips and starts to fuss, you can give him or her 5-10 minutes to see if they can’t figure it out on their own before responding. If he or she is unsuccessful and is still crying out with frustration, you can go in and reassure your baby intermittently until they calm and settle into sleep again – every 2-10 minutes is best. You will want to leave larger gaps between reassurances over the next couple of nights so that your baby doesn’t become dependent on you to get back to sleep (another sleep association that we are trying to avoid). This may take a little time, and I recommend you staying with your child until they fall back to sleep if you are particularly worried about tummy sleeping. If your baby is asleep on their tummy and not awake on frustrated there, HURRAY! Please leave them there. Your baby over the next few months will find favoured sleep positions of their own and, like us, find it reassuring and comforting to settle peacefully to sleep each night. If tummy sleeping is really getting the better of your anxiety, then please go and flip them ever so quietly and be prepared for a few frustration tears if they wake up in the process. Then reach out to your doctor or paediatrician for additional support or advice to settle your fears. For those of you who have not sleep trained, now may be an excellent opportunity to speak to a Sleep Trainer or Sleep Consultant. For some, it only takes a couple of nights of broken sleep to overcome the rolling sleep disturbances. For others, it has opened the floodgates for a whole host of sleep challenges that may now need to be addressed as a whole.